In her excellent debut novel, ‘The Last Place You Look’, young US writer Kristen Lepionka has taken several sizeable authorial risks: a relatively unglamorous suburban setting, a crime seemingly tinged with race issues, characters that are (mostly) urban-middle-class-America normal, and a protagonist who fails to tick most of the ‘safe’ boxes for lead investigator choice: a young woman PI, a near alcoholic with a gapingly empty bank account, still grieving her dead cop father. The bar Lepionka set herself is high, and I’m happy to say, as reviewer and above all reader, that she clears it in style. 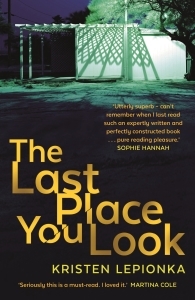 ‘The Last Place You Look’ is written in a direct, engaging fashion, it flows at a near-faultless narrative pace, and has the mark of a seasoned author’s work. But there’s nothing seasoned in the energy which Lepionka infuses in her novel. Both characters and plot sizzle with it, as Lepionka has the confidence of making what is apparently a straightforward, classic plot branch out in several directions, all of which she handles with assurance. Columbus, Ohio: Roxane Weary, a woman in her early thirties, the daughter of murdered hero cop Frank Weary, isn’t exactly the town’s most glamorous or popular private investigator. Her PI career is at an all-time low when she is hired by Danielle Stockton, the sister of Brad Stockton, a young African-American on death row for the murder fifteen years before of the white parents of his girlfriend Sarah Cook, who herself disappeared the day of the murder. Brad’s execution is only two months away, and his sister hires Roxane in desperation, to search for a woman she has recently sighted in Belmont, the Columbus suburb where Sarah Cook lived: Danielle is dead sure the woman she glimpsed only a few days before is none other than vanished Sarah herself. No one has seen Sarah since the day of the murder, and the police and Brad’s lawyer’s investigator failed to find her. Eventually, no one bothered to believe she could have killed her parents and done a runner: after all, ‘black guy kills white girl’s parents who disapproved of their relationship, and girl too’ (though this was never proved), worked well for the cops and the DA at the time. Roxane doesn’t have much to start with: a very cold case and a dubious sighting of a long-lost woman. Personally, Roxane is quite a mess, still struggling to come to terms with her father’s death nine months earlier. But she’s determined as hell, honest and likeable in a rough-and-ready way. Lepionka sketches her through tight first-person narration and whiplash-sharp dialogue, and does a great job of it, avoiding the most obvious PI tropes and painting a very convincing picture of a troubled, independent young woman. Characterisation is one of the novel’s strongest assets. Besides Roxane, Brad Stockton and his sister Danielle, we soon meet Kenny Brayfield, marketing entrepreneur from a rich, local white family and a school friend of Brad and Sarah Cook, and Peter Novotny, Brad’s lawyer’s investigator and a former cop who knew Frank Weary. He, Kenny Brayfield and of course Danielle Stockton all swear to Roxane that Brad could not possibly have killed Sarah or her parents: he is too much of a nice, respectful guy – though Kenny hints at some escapades they had together as kids. In the first three chapters, Lepionka introduces an unusually high number of characters, especially for a debut novel, yet each of them is clinically chiselled, with enough relief to make them interesting. Each of them a believable blend of commonplace and quirky, each of them just a little flawed, enough to make them recognisable as people we may either know or deal with in our daily life: the earnest sister who may well be embroidering the truth; the creepy, smooth-talking rich kid with an attitude but not enough experience under his designer belt to carry real weight; the stranded young woman who wants to make a living from the investigative nose she inherited from her father, and is constantly caught between being a nice person and a hard hitter. Then Roxane meets Brad in prison. He believes he’s innocent of the horrendous crimes he’s been sentenced for, and yet, though it could be his only chance to muddy the waters and perhaps earn a reprieve, he would not say a word against Sarah, and only feels with heart-breaking conviction that she must be dead. After the frustrating meeting with Brad, Roxane nevertheless starts investigating Sarah’s sighting, and only comes up against the antagonism of the entire Belmont police, from the beat cops to the local chief, all of them far from keen at having a rather down-at-heel PI, and a woman too, rummage around a case which for them is well and truly closed. Undeterred, Roxane keeps searching. With help from Tom Heitker, Frank Weary’s former cop partner and her occasional lover, she discovers an old missing person case from the same area where Sarah Cook lived: Mallory Evans, a young mother who disappeared without trace many years before, a case Roxane’s own father had investigated in vain. Digging deeper, Roxane comes across another missing girl, Colleen Grantham. She was a troubled teenager whom everybody assumed had fled home, though her parents always maintained something tragic must have happened to her. But she was never heard from nor found, dead or alive. And then another young local girl goes missing, a friend of Mallory Evans’ daughter. I have to stop here, but there is still plenty more to the very clever plot Lepionka has weaved. It is a tribute to her skill that, as a reader, one is never lost in its twists and turns. The pace, except perhaps only occasionally in the central section of the novel, never sags, sustained both by the action and by the sharpness of the characterisation. 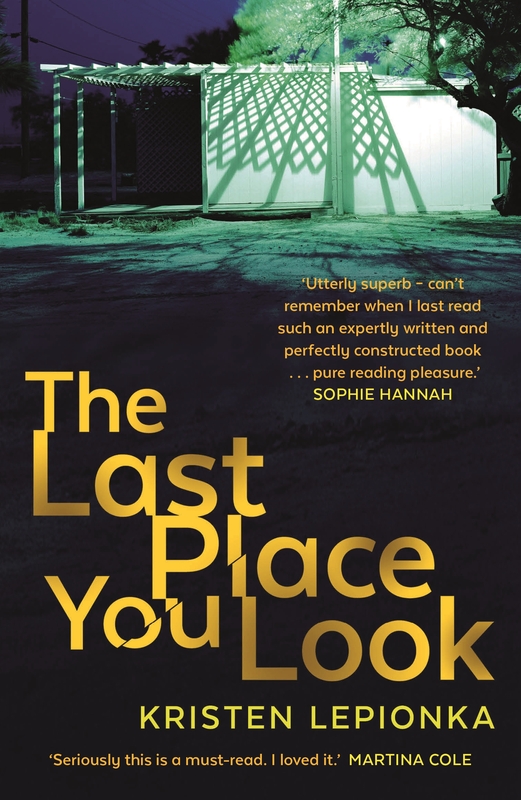 ‘The Last Place You Look’ is remarkable in the balance of all its elements – plot, characters, setting, dialogue – all of them smoothly assembled in what I truly hope is only the first of a string of novels from a highly talented author.